Back to Quelccaya! Earlier this month we spent a couple weeks on and around the ice cap, continuing climate system research. We began the expedition as a large group with a diversity of backgrounds and interests; lots of interesting discussions ensued, while hiking and during meals. Here are some images from the adventure. Austral winter in the Cordillera Vilcanota is typically cold and dry, with stable weather ideal for conducting fieldwork on Quelccaya. This is not how June began this year, however, as late-season snowfall during April and May continued (see 4 May entry). Here we are looking north over fresh snowcover toward Qori Kalis outlet glacier (not visible). Strong convection is already underway by 10 AM, which brought snow squalls during the afternoon. At the summit a week later we attributed ~90 cm of snow to late accumulation. 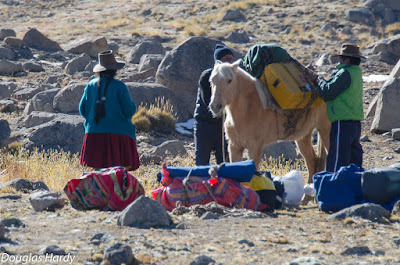 Most of the group arrived at Moraine Camp during a heavy precipitation event on the afternoon of 2 June. For more than 2 hours, large grains of graupel pelted us, driven by wind and accompanied by lightning and thunder. One lightning strike was particularly impressive (and frightening), striking a path below camp. Later we learned from our arrieros (see below) that lightning has been unusually prevalent this year, killing numerous alpaca and at least one person. 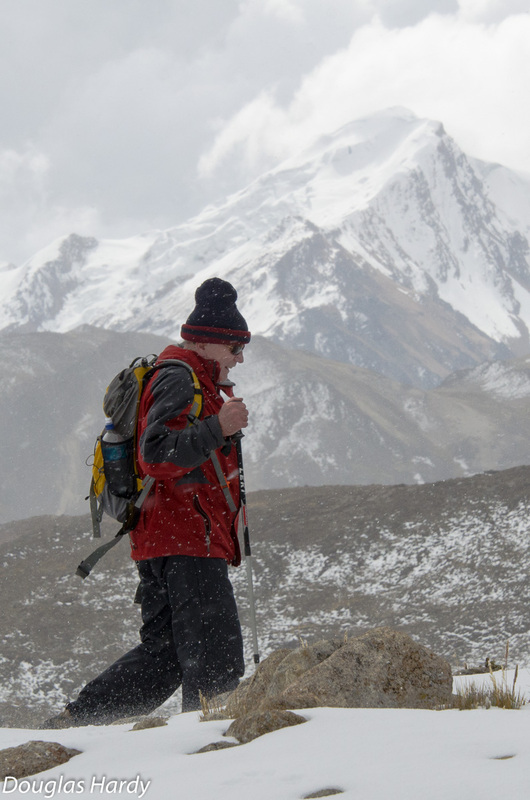 More than 40 years after his first expedition to Quelccaya Ice Cap, Lonnie Thompson was delighted to be back in 2015. 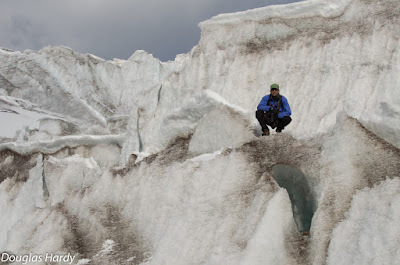 Once again, he carried out a full schedule of photographing the margin, searching for old in-situ plant material emerging from beneath retreating ice, visiting Qori Kalis, and collecting snow and firn at the summit to extend his ice core record. The approach to Quelccaya is now considerably shorter than it was in 1974, yet Lonnie confirms that the partial pressure of oxygen at 5,700 m hasn't gotten any higher! Collaborating with David Chadwell (UCSD & Scripps) we continue to quantify the magnitude of thinning at Quelccaya since 1983, when Dave worked with Henry Brecher to carefully survey the glacier. 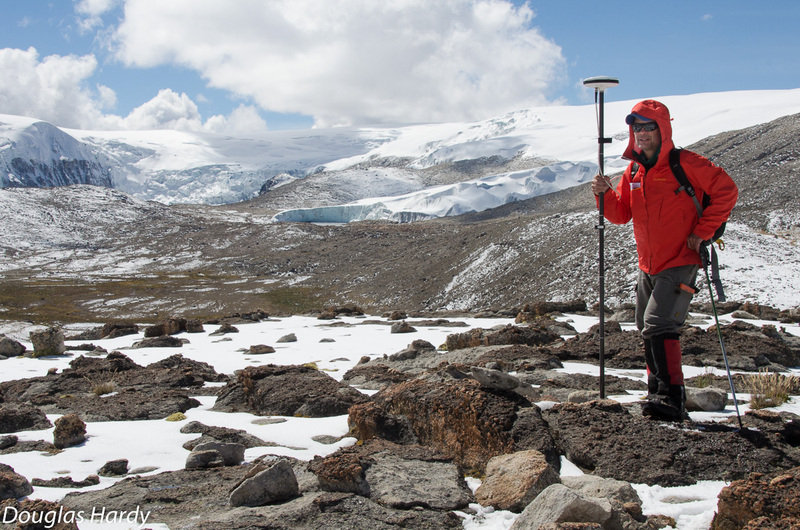 Above, Carsten Braun is making a geodetic-quality GPS measurement at one of our reference stations, prior to re-visiting numerous sites on the glacier where elevation is accurately known from the 1983-84 measurements. A manuscript detailing this work will be submitted shortly. The majority of our time at Quelccaya was occupied by raising the AWS tower, to accommodate the summit's positive mass balance. Working together with Carsten as well as Koky Castañeda through most of 6 days we performed a complete annual service and raised everything by over 3 m. In this upward-looking view (note wind sensor), only a final trimming of guy cables and bundling of sensor leads remains to be done. The AWS is ready for another year of measurements. 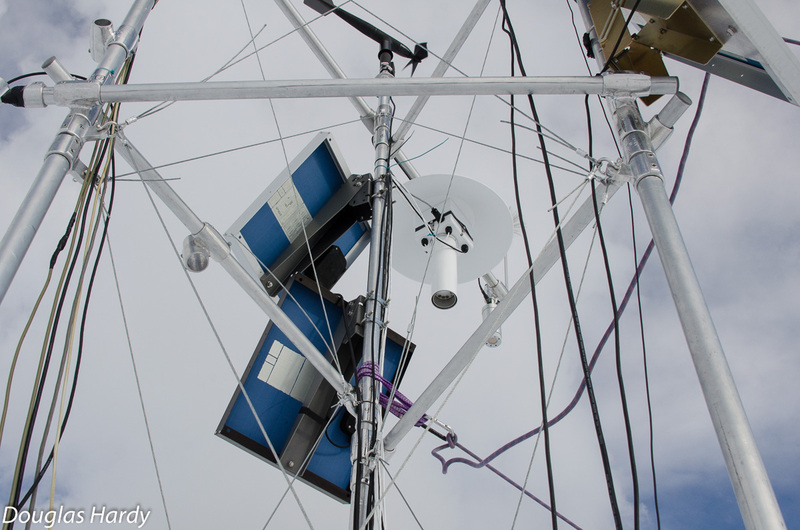 One of this year's most-difficult tasks was adjusting the tower orientation to account for glacier flow. Notice how the lowest section of the tower appears tilted? It is indeed, because the tower extends another 25 m beneath the surface! 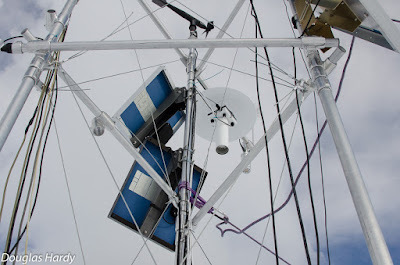 Although the station is located more-or-less at the ice cap summit, where the flow vector is essentially vertical, enough differential horizontal motion has occurred since 2003 that keeping the tower plumb is not a trivial task. Felix, Koky, and Theodoro in the snowpit, approaching 3 m depth. Here, density measurements and snow samples have been collected in the upper portion, from the shaded south-facing wall (for stable isotopes, black carbon). Just coming into view behind Theo in the deepest section is the 2014 dry-season surface. This marks the beginning of 2014-15 accumulation, and this year the 'surface' was more of a 'zone' than normal, because there was not a prolonged interval without snowfall. 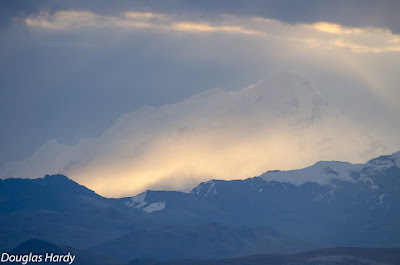 Late afternoons were often spent at the glacier margin not far from camp, observing bird behavior and searching for nests used during the prior breeding season. Note the faintly-visible nest within the cavity below Koky (used by Diuca speculifera; more here). At the time this nest was occupied it was likely even more recessed from the vertical ice face, so protected from weather and relatively safe from both terrestrial predators (e.g. foxes) and from those above (e.g., Mountain Caracara, Phalcoboenus megalopterus or Aplomado Falcon, Falco femoralis). The vicuña population near Quelccaya has increased tremendously in the past decade (Vicugna vicugna). Groups are frequently seen and heard in the area, right up to the glacier margin. Carsten & Koky: the best! Fieldwork for June 2015 is now complete, and prior to posting details of our largely-successful trip, I want to first acknowledge these two guys. 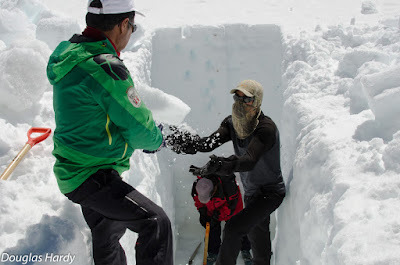 Through two weeks of not-always-ideal weather at Quelccaya, including six trips to the summit and 6+ meters of digging, no one could ask for more competent and enjoyable assistants/companions. 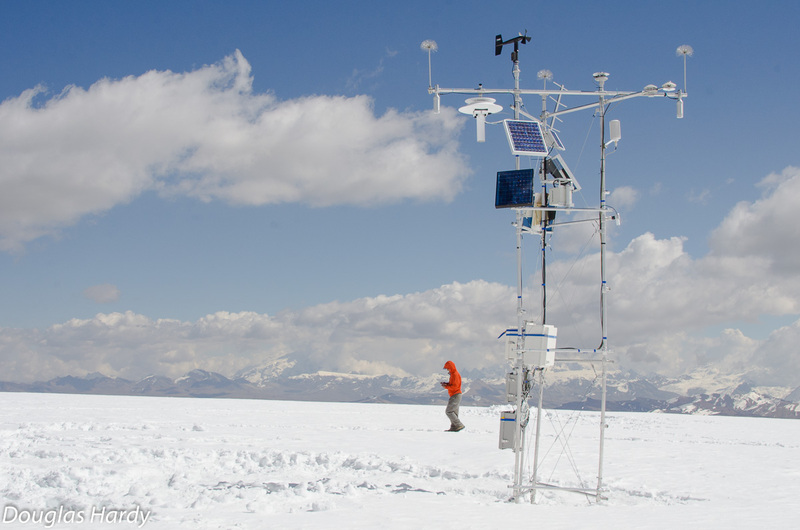 Carsten loves to point out that there are very good reasons why so few automated weather stations (AWS) exist in glacier accumulation zones. This is true, and the Quelccaya AWS would almost certainly not continue functioning so well - and for so long - without the involvement of these two! 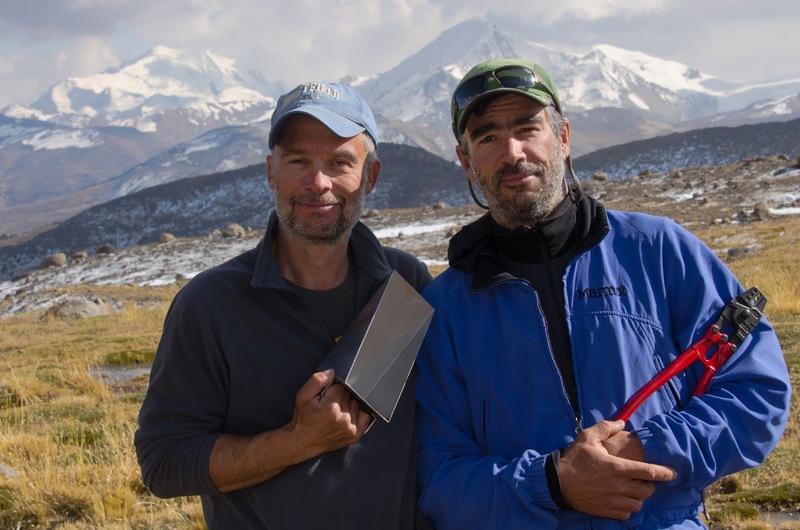 The following points provide a glimpse of the critical role played by Carsten & Koky at Quelccaya, this year and in previous field seasons. The work. Repeatedly ascending to 5,700 meters is the fun part of our fieldwork. 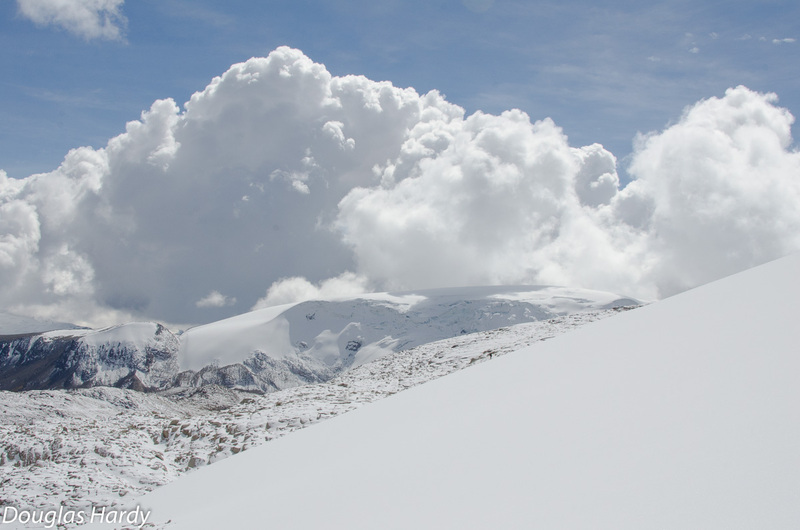 While at the summit - through the full spectrum of Andean winter weather - our work is strenuous and stressful. Among the tasks required in raising the entire AWS tower and electronics by 3 meters are lifting four different enclosures with >100 Ahrs of batteries, swaging dozens of cables together for structural integrity (see red tool Koky is holding), climbing and balancing on the 5 meter-tall tower while using various tools in one hand, and thinking clearly enough at 500 hPa to solve a diversity of mind-bending problems that invariably develop. In the snowpits, collecting and recording details of nearly 100 samples is laborious, while measuring density can be downright exhausting (see Snowmetrics tool Carsten is holding); for the first time, one sample this year exceeded 600 kg/m^3. Yet in all aspects of the work, these guys remain dedicated to completing every task precisely! Being in the field. Keeping glacier fieldwork both safe and fun is not always trivial. However, Carsten and Koky's depth of experience - and their fitness - minimize the impact of problems and discomforts which arise. Both recognize that occasional frustrations are to be expected; once challenges are overcome, they move on. And although all of us would be perfectly happy working up there without Bob Marley, Koky's incredible music archive makes the effort a tiny bit more fun. The science. Science, after all, is the raison d'être for being at Quelccaya - and this is always at the forefront of our thoughts. Despite jokes about how much easier our lives would be if we had concentrated on modeling climate rather than measuring it, we are all addicted to the process of doing science in the field - reveling in the the excitement which sometimes results, and accepting the inevitable difficult and tedious moments. In reality, many aspects of the science are done either prior to fieldwork (e.g., designing and planning measurements/sampling), or upon return when data processing and sample analyses are done. During intervals of breathlessly digging snow, or gradually freezing while making motionless observations of bird behavior while they prepare to roost inside the glacier, Carsten and Koky always persist cheerfully. 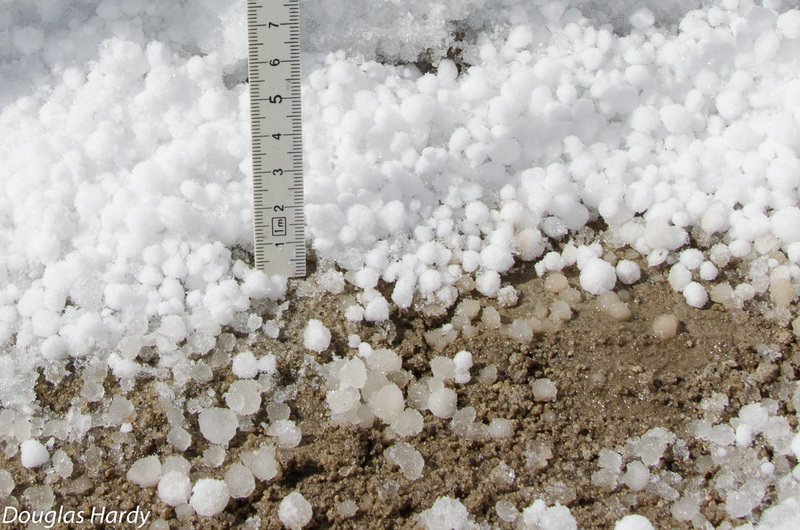 With fieldwork, one never knows when an unexpected situation or observation might prove valuable, whether in interpreting a landscape feature or providing insight into the various processes by which snow accumulation is transformed into a climate record. Our science benefits by having six eyes and three brains on the job! So, Carsten and Koky once again earn a gigantic "thank you" for their efforts this year. We also thank those behind the scenes, including our entire logistics team led by Benjamin Vicencio, the creative wizardry of modelers with whom we work (M. Vuille and J. Hurley), and others who have helped to keep this project going over the years (R. Bradley, L. Thompson). Finally, we are grateful for both financial and technical support from NOAA ATDD/GCOS as well as NSF.